A problem with the random generation of worlds in Traveller is that for small worlds (where size < 4) is that these worlds might get an ordinary breathable atmosphere. This is a problem, since the minimum molecular weight retained for a planet shouldn’t allow that. EDG has explained minimum molecular weight retained here, and here is a nice visual tool for checking what gases will be retained depending on size, density and temperature. This problem leads to silly explanations. Like the one in both the GURPS and Mongoose Sword Worlds modules where a planet (Enos) is made of Osmium. Other explanations might be terraforming by the ancients. I usually ignore this problem, since our group of Traveller players don’t care about details like this. They want to play the game. But if the question is asked, I now have a solution. Instead of explaining every world or changing the UWP, I use this table. 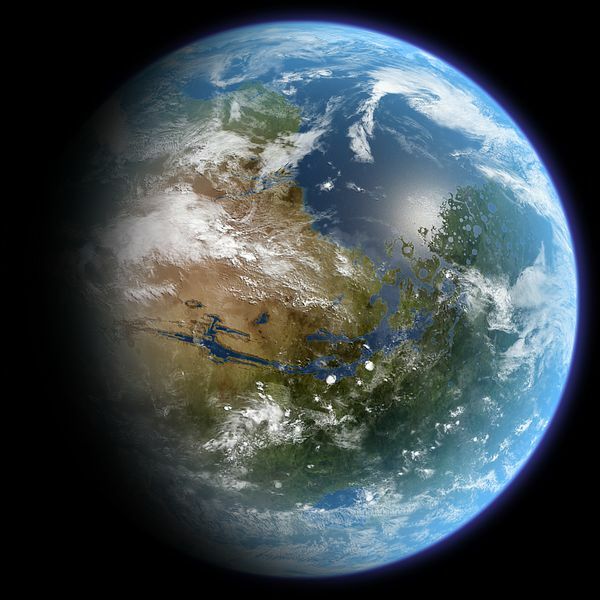 Terraformed Mars: File from wikimedia. Licensed under the Creative Commons Attribution-Share Alike 3.0 Unported license.